give it a whirl and see how we like it! I had previously planned to paint the tile floor in our entryway, I'm talking like over a year ago. I purchased all of the supplies for it, and I was ready to start...if only I could find the time. I kept hesitating because I knew it was going to take several days, or more like a week of working on it after the kids went to bed. Plus our front door would be out of commission during that time. Well, it never happened. The supplies sat in our basement and collected dust. Until this past weekend when I got a wild hair and thought I would finally put them to use! 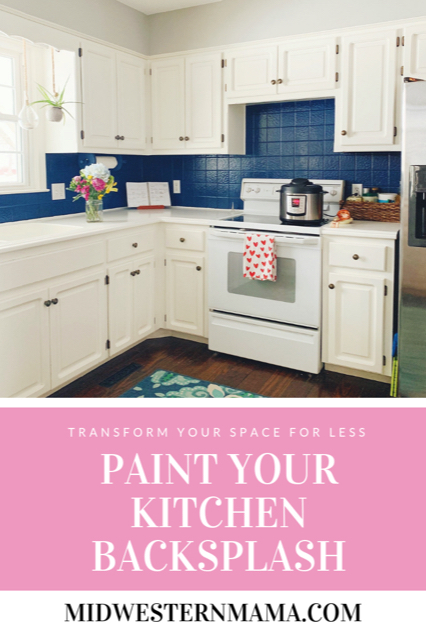 Since we are planning to renovate at least part of the kitchen (if not all of it), painting the backsplash wasn't so scary considering it will most likely be a temporary solution. But honestly, I love the way it turned out, so I wouldn't be too terribly disappointed if we end up stalling the renovations a little longer! So, HOW? Well, I will tell you! I got my original inspiration from Mysha at Remington Avenue, when she painted her bathroom tile with a cement tile stencil. It was so cute, and I proceeded to order a stencil for my tile entryway. I did a few things differently, so I'll share below the steps I took. 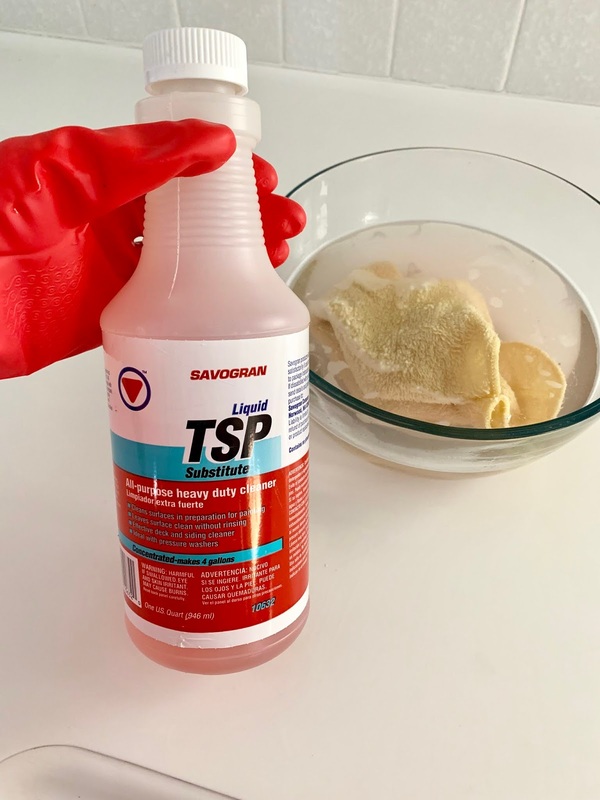 It's super important to clean the area thoroughly, especially if you are working in the kitchen where grease has probably splattered! I used TSP Substitute to wash down the backsplash. I gave it two good washes to make sure it was squeaky clean. Mysha recommended sanding the tile with sandpaper, but I didn't feel like it was doing anything. Maybe it has to do with the type of tile you have, but I happened to have some deglosser from a previous project, so I used it for the backsplash. It's important to use painter's tape to protect the areas where you don't want paint to run or drip. I even used some brown contractor paper to cover part of my countertop and it was helpful in catching the drips. I used a small, flat craft paintbrush to trim out the edges. This was much easier because my roller didn't reach to the edges and corners. A foam brush would also work well. Using a foam roller, I painted a thin layer of interior latex paint in the color Lost at Sea by Sherwin Williams. Let it dry completely between layers. The first coat will look awful (as seen above), but don't fear! 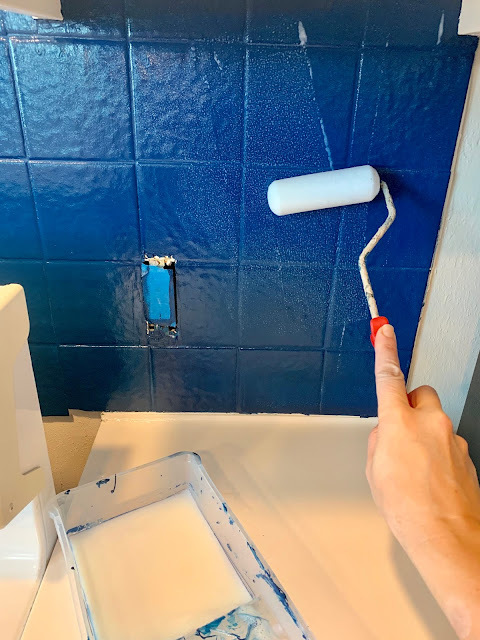 I ended up painting three coats of the navy paint to get the coverage I was wanting. This step is annoying but it's important. 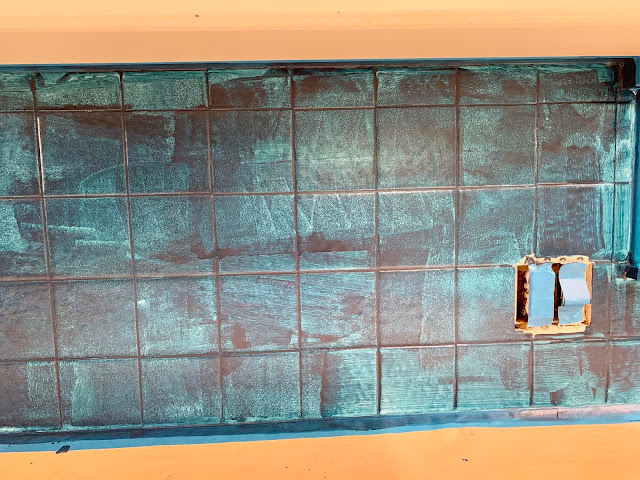 You will want to carefully remove all of your tape (use a utility knife if you need to), then retape prior to applying the polyurethane sealant. 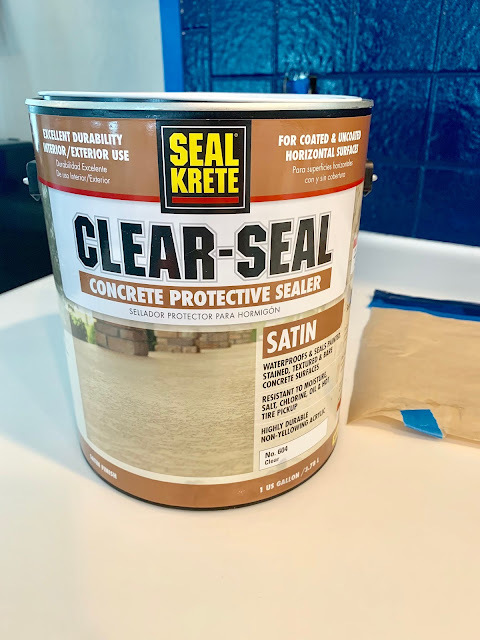 The reason this is so important is because you may accidentally tear or pull off some of the paint, so you will want to touch it up prior to sealing it. 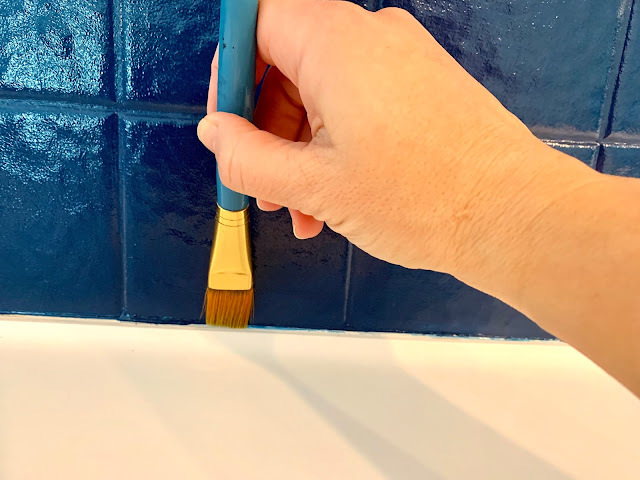 I used my same flat craft brush to fix any imperfections in the blue paint. Also, If possible, try to retape slightly way from the paint line to ensure the edge of the paint is sealed with the poly. I have read several different blogs by people who have painted their tile. They all seemed to use a different type of coating, but most were just a form of polyurethane. The key is doing several thin coats and allowing it to fully dry between coats. 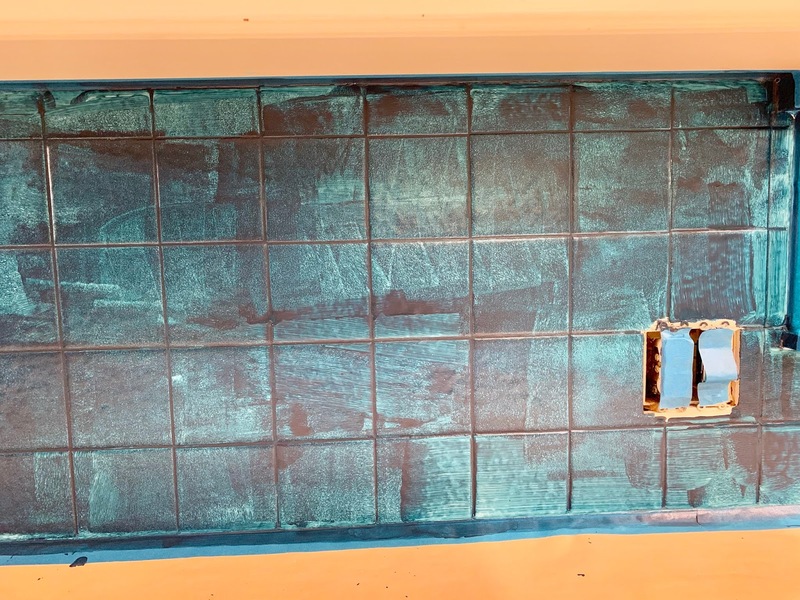 Since this backsplash won't get a lot of wear and tear like a floor would, I was lazy and just did two coats, but if I was applying it on a floor, I would do several. I had previously purchased the Seal Krete brand floor coating because it is made for garage floors, and I figured if it was strong enough to drive a car over, it was strong enough to withstand some foot traffic. 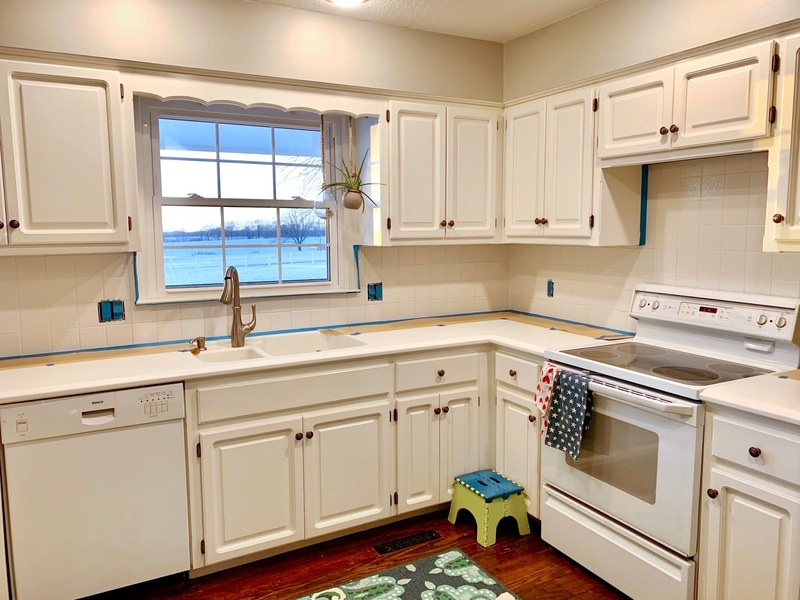 It's probably more than sufficient for this kitchen backsplash. I rolled it on with the same type of foam roller I used for the paint. 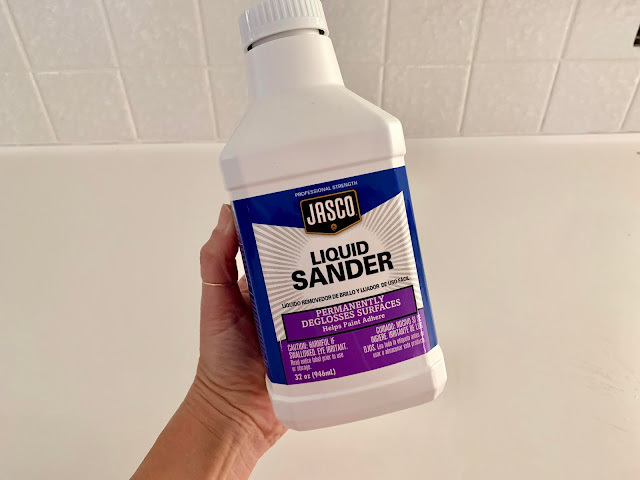 If you find that the paint does not leave a clean line where it meets the countertop, you can fix that by running a thin line of white caulk to cover the seam. And that's it! All in all, it was a fairly easy project. Time consuming in that I had to wait for each coat to dry thoroughly before I could move on, but nothing about this project was difficult. And for under $100, it is quite the transformation! I have linked the products I used, or similar products! The links I use may be affiliate links, which means I may make a small commission. Thanks for helping me support my blog!